In Ben Ashline’s garage, there are mementos everywhere. Trophies sit in clusters all over the place. At first glance, it doesn’t look like there’s room for any more, but you know space will be found when it’s needed. The hoods of long-retired racecars are mounted on the back wall, including the hood to Gary Ashline’s Camaro, the car that kind of started all of this. A handmade sign hangs above a door. “The Kid is back,” it reads. The Kid, Ben Ashline, stared at his car. The front end was disassembled, and the ugly, bent frame, the reason the car sat idle in the garage, attracted the eye in the most negative of ways. Like a scar across the forehead. Right now, that car is the biggest memento of all. The frame was bent on July 22, in a qualifying heat for the TD Bank 250 at Oxford Plains Speedway. Ashline started the heat in 11th place, and made the decision to be aggressive and try to get to the front as quickly as possible. Ashline found an outside groove, and was moving up when he was bumped. Ashline’s tires caught the dirt and he lost control. He hit the wall. Ashline knew his move was risky. He also knew he had to try. The TD Bank 250 is one of a driver’s best opportunities to win money each summer. “There was 25,000 reasons for me to go out there. I wanted to win, just like everybody else,” Ashline said, referring to the prize for winning the TD Bank 250. Ashline said it will cost between $2,500 and $3,000 to fix. “It can be fixed. It just takes time and a bunch of money,” Ashline said. Ashline is just 21. He has plenty of time. The money? That’s the problem. First, Ashline must scrape up enough cash to get his No. 15 car fixed. He hopes to always drive No. 15. One, it was his father’s number at Wiscasset. Two, when Ashline won his first late model race in 2010, it marked the 15th anniversary of his mother, Debra Ashline, being cancer-free. The car is a working tribute to his family, and it must not collect dust in the garage. This is Ashline’s second year on the American-Canadian Tour. The Tour races all over New England and eastern Canada, and competing on a budget as tight as Ashline’s is difficult. “To be competitive on the ACT, you’re probably going to spend, and this is really scrapping by, $20,000,” Ashline said. Since wrecking at Oxford Plains, Ashline has missed two ACT races, at Beech Ridge in Scarborough on July 28 and a stop in St-Pie, Quebec last weekend. Ashline, who had one win, two top five finishes and two more top 10s in his five races this season, has dropped to 17th place in the Tour point standings. In the same Pittston garage in which his car now waits for a cash infusion, Ashline works fixing used cars. He does odd jobs. Any money he makes gets set aside to keep his race team going. A set of racing tires costs $500, and you can count on using a new set every race. The 110 octane racing fuel is $10.50 per gallon, Gary Ashline said. Every race weekend, a team will spend at minimum $1,200. If you win just a little, say $1,500, you’re just covering your costs. Ashline gets some sponsorship help, $100 here, $500 there, as he puts it. D.S. Norton Construction is on the hood, and has helped the most, Ashline said. There’s L.A. Harley, Berube’s Auto Care, Sam Snow Construction, Distance Racing Products, Blackpoint Auto and Towing, The Sign Store, Coastal T-Shirts, JCB Productions, and M Rolfe Designs. They help out when they can, Ashline said, cutting the team a deal on shirts, taking pictures, even working on the pit crew. Where Ashline spends around $20,000 to get through an ACT season, many of the other drivers on the Tour have considerably deeper pockets. The website for current ACT points leader Wayne Helliwell, Jr. lists 11 sponsors and team owner Bruce Bernhardt. Brian Hoar, currently third in the ACT points standings, has sponsors such as Ford Racing and Sunoco Race Fuels. “We can’t afford to play this game the way a lot of guys can play it,” Gary Ashline said. That fact is not a deterrent to Ashline, just an obstacle. Taylor said the money Ashline is able to spend compares to what the average guy racing on Saturday nights at a small track might spend. Even so, Ashline has enjoyed success on the ACT tour. Last season, Ashline was the Tour Rookie of the Year. After failing to qualify for the first race of the 2011 season in Lee, N.H., Ashline went to Thunder Road in Barre, Vt., and finished eighth. The next race, at Devil’s Bowl Speedway in West Haven, Vt., he finished fifth. “We were on cloud nine at that point. We can run with these guys. The car will hold up. We can compete with them,” Ashline said. Ashline had a strong debut season, and despite wrecking in the last race of 2011, Ashline was determined to improve this season. On April 15, Ashline placed fifth in the season opener at Lee USA Speedway. On May 20, he won the Armed Forces 150 at Oxford Plains Speedway, taking home $3,125 and moving up to seventh in the points standings. 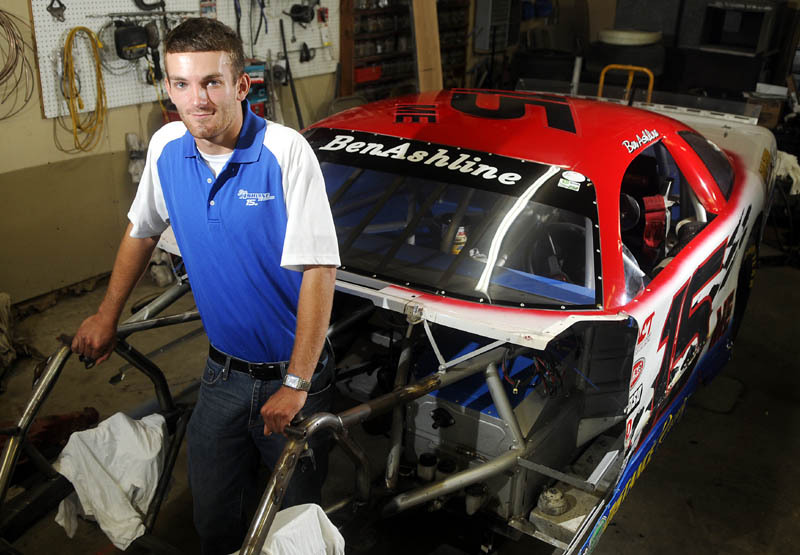 Before his wreck at the TD Bank 250, Ashline was tied for 11th place. By winning the Armed Forces 150, Ashline earned a spot in the Bond Auto ACT Invitational at New Hampshire Motor Speedway in Loudon, on Saturday, Sept. 22. It’s a big race, a chance to showcase your driving ability on a bigger stage. Ashline received his invitation letter shortly after his wreck. Scraping up the money to fix the car this season became even more urgent. Ashline sent back his reply. He’ll be there. To get sponsors, you have to race. To race, you need money. Right now, Ashline doesn’t have enough of either. “I have to try and impress somebody with my driving. We, as a team, have to impress somebody that will back us, support us and have faith in us,” Ashline said. Ashline fell in love with racing watching his father race at Wiscasset Raceway, until Gary stopped racing in 1998. Gary would let Ben start the car and warm it up. When he was 8, Ben learned how to drive a stick shift, driving an old truck on back roads with his father near the family’s Pittston home. Gary Ashline remembered how excited Ben would get to go to the Northeast Motorsports Expo at the Augusta Civic Center each year. Ben raced go karts, first at Beech Ridge Motor Speedway then all over New England, for six years before trying his hand at Late Model racing at Oxford Plains. Ashline and his father got a deal on a chassis, and built a car by finding parts in junk piles. “We went to the racetrack at talked to as many teams as we could,” Ashline said. “My dad had never raced a late model. He’d never been a part of that. It was a new experience for him. We didn’t have a clue what we were doing. Stripped it down, painted it, built it, what we thought was right. Knowing what I know now, we were in left field, but it got us to the track, got us around the track, and got me experience. After a few years, Ashline was able to buy a car from Ken Farley of Freeport. For $5,000, Ashline got everything except the seat, motor and transmission. “(Farley) let me drive it just the way he had it the first week. Didn’t give him a dollar. That was kind of sketchy, I was driving a car we hadn’t necessarily paid for yet. We did OK, middle of the pack,” Ashline said. Ryan remembers Ashline as a driver eager to listen and improve. Ashline won by half a lap in his third race with the Farley car, and before the 2011 season, he and his father discussed giving the ACT a try. The races at Lee and Thunder Road were before Oxford Plains opened, so why not test the waters? At Lee, Ashline was spun out on the first corner of the first lap, and came within one spot of qualifying. At Thunder Road, he focused on just not hitting the wall. “We qualify and we finish the race, and I finish eighth and do not hit the wall. The car’s in one piece. That was a big boost for us,” Ashline said. This year, Ashline started driving the car built for him by Taylor. Neither Ashline nor Taylor could say what Ashline paid for the car, but Taylor noted that to replace all of the car with new parts would cost in the $30-35,000 range. A big reason for Ashline’s success this year is working with Taylor at his Fairfield garage this past winter. More than anything, Ashline said he learned how to take care of his car. From Taylor, Ashline learned to focus on the details. Listen to the car. “Just work on your car. A lot of people will sit and say, ‘I’ve worked on my car. I don’t know why I can’t go any faster.’ Work on your car, every aspect of it. Think about it, why it’s doing that? Digest different things and characteristics… Wrenches don’t turn themselves, and you know you’re not going to get any better if you don’t work on it. That’s what he told me every day,” Ashline said. “I think the world of (Taylor). He’s done so much for me. With no money to waste, Ashline’s apprenticeship under Taylor can only help in the long run. “If you do this for a living, even for a short time, you see where everybody goes wrong, and it shortens the learning curve,” Taylor said. Ashline hopes to move on to Super Late Models. They’re bigger cars, with two inches more of tire and a bigger engine. He wants to go faster. “I just want to race. You won’t talk to a kid who’s racing, a young racer, who won’t tell you they want to make the (Sprint) Cup. Everybody does. You won’t talk to a basketball player who says he doesn’t want to play in the NBA someday or a football player who doesn’t want to be in the NFL,” Ashline said. Ashline will make his pitch to potential sponsors and continue to save. Both he and his father are convinced they’ll be at Loudon in late September.